My first thoughts after reading this book are that it could benefit from some reorganization. I’m not a huge fan of the format, in which each character has his/her respective stories devoted to a third of the book, nor the order they’re presented in. I would have much preferred if this were organized in the style of traditional Star Wars novels of the past, where stories of unique characters are told simultaneously in thematically-related portions. It felt a little disjointed having the teases to the opening of The Force Awakens occur at three different points, making this seem less like one book and more like three separate novellas. 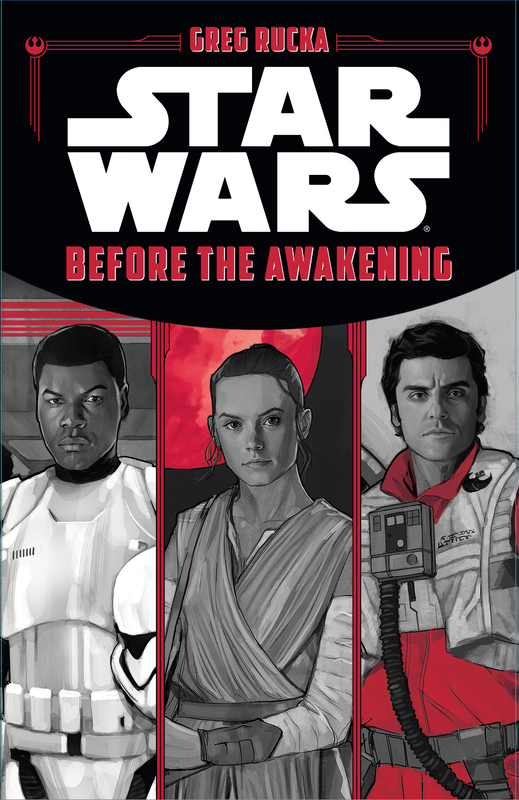 If actually editing this book into a compelling format isn’t an option, at least move the character stories around to give a little more grounding (open with Poe, where we get galactic context, then Rey, then Finn). This first character prologue is written well enough, and a compelling bit of insight into the lives of these First Order stormtroopers we’ll be getting to know over the course of the Sequel Trilogy. However, this look-in contradicts an important part of Finn’s backstory that we’re given on screen in The Force Awakens. As Before the Awakening would have it, the assault on the Jakku village was not FN-2187’s first mission, but rather his second. This prologue does great work to establish FN-2187’s relationships with the other members of his squad (all of whom except FN-2187 are given nicknames: Nines, Zeros, and Slip) via training exercises and simulations, giving the stormtroopers distinct personalities and character qualities. The reader sees FN-2187’s natural compassion and empathy emerge as he tries to carry the weight of a struggling squad member, Slip. These qualities are quickly identified as a weakness by Captain Phasma, and she seeks to rectify the problem. Ultimately, however, this prologue concludes with a rather lackluster first mission for FN-2187 and his squad that essentially contributes nothing to their development as characters and, frankly, has no place and serves no point as a precursor to the emotional scenes in the Jakku village. It’s somewhat frustrating to see this kind of discontinuity so early in the formation of the new canon Disney/Lucasfilm has sought to establish, as these kind of things are what plagued the old EU/Legends for many years. Why try to overwrite the scenes presented in The Force Awakens and strip them of their significance (e.g. : Jakku being Finn’s first battle) without a clear purpose in place? In short, this prologue would have been great had it ended 12 pages sooner. This character prologue follows Rey as she finds a light freighter, a Ghtroc 690, in the junkyards of Jakku and seeks to repair the salvage into working order. Off the bat, it’s really nice to see some of Rey’s ingenuity and self-sufficiency explored and developed in off-screen material, since many find it hard to believe a character can come into the world of Star Wars already partially developed (especially with all of the Mary Sue nonsense floating around of late). As far as character insights go, it’s very interesting to get a glimpse into Rey’s voluntary solitude and steely determination, as one sees in an early exchange between Rey and two other scavengers, Devi and Strunk, whose company and inquiries she is immediately suspicious of. This prologue goes on to show one (of what can be presumed to be many) of Rey’s salvage projects on Jakku. She, after reluctantly accepting the help of Devi and Strunk, restores the Ghtroc 690 which she intends to sell to Unkar Plutt for an exorbitant sum of sustenance portions rather than using it to leave Jakku (as Devi and Strunk hope and suggest when helping on the project). After Rey works on the Ghtroc for the better part of a year, as this character prologue details, it is finally ready to be sold to Unkar Plutt. Rey, Devi, and Strunk put on a show as they fly the freighter into Niima outpost, where Rey will negotiate her price with Unkar. Rey disembarks and before she knows it, Devi and Strunk blast off without her, leaving her with nothing for her months of hard work except her trust issues validated. Luckily, unlike the Finn chapter, this section doesn’t do much to alter the growth of the character we see on screen (intentionally or otherwise). It does, however, provide a very solid and concise look at just how awful Rey’s day-to-day life on Jakku really is, and highlights some of the worst aspects she’s had to face growing up on that junkyard of a planet. Of the three, this prologue to The Force Awakens gives the most insight into the galaxy’s political formation in the years after Return of the Jedi and the situation currently plaguing the Republic and the Resistance. The story picks up with Poe serving as a pilot in the Republic Navy (not the Resistance, to be clear). He flies a rescue mission where he encounters a First Order squadron, his concerns about which are dismissed by his commanding officers. Poe recklessly decides to go on a rogue mission after the distressed freighter the First Order captured, in order to gather evidence that the First Order may be a bigger threat than Republic command and Senate acknowledge. Poe’s mission, and the intelligence he and BB-8 managed to gather, comes to the attention of General Leia Organa, who has Major Ematt intercept Poe upon his return to base. Leia asks Poe to tell her everything he knows about the captured freighter Yissira Zyde. Poe is then promptly sent on a mission for the Resistance by Leia to capture information aboard the luxury yacht Hevurion Grace. Leia suspects the Republic Senator who owns the ship has been conspiring with the First Order and Leia needs evidence—the ship’s travel logs—to prove it. Resistance Commander Poe Dameron and what’s left of his Rapier squadron from the Republic successfully pull off the heist, despite another close call with First Order forces. The chapter ends with a mention of the mission that opens The Force Awakens, the quest to find Luke Skywalker by way of Lor San Tekka. This is a pretty decent companion piece. It doesn’t go quite as far as The Force Awakens: The Visual Dictionary in terms of the insight it provides, but it does well to wrap what it can into three succinct narratives featuring our new heroes. I would have liked more (what Star Wars fan wouldn’t), but Greg Rucka has done a good enough job on this piece to keep me satisfied. The action and stories move along quickly, and the book is reasonably priced on Amazon (in hardcover or Kindle editions). If you’re looking for a few fun adventures and to spend some time with the characters who will come to be the heroes of the Sequel Trilogy, I’d definitely recommend giving this book a read. Star Wars Land to be featured in the 127th Annual Rose Parade!